Horizon Zero Dawn lives up to its massive hype, and possibly exceeds expectations, delivering a memorable new IP with engrossing gameplay and gorgeous visuals. Guerrilla Games has a history of games that range from pretty decent to great, focused around the shooter genre. Yet they always missed that game that would truly define them, a masterpiece that would propel them in the pantheon of the industry gods. 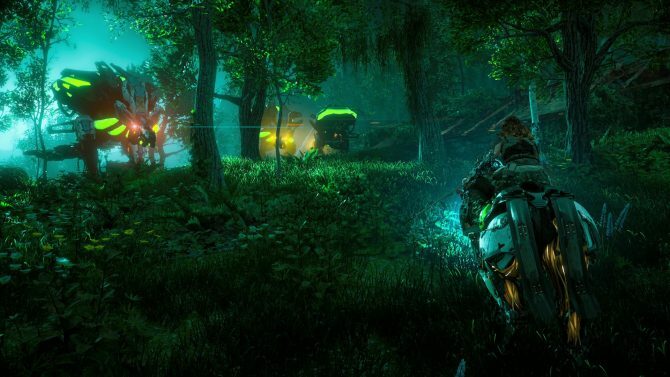 Especially after Killzone 2, which many consider their best title to date, it seemed that Guerrilla has been struggling a bit in finding its stride. Yet, it turns out they were just gathering their strength for a massive leap ahead, and that leap is Horizon Zero Dawn. 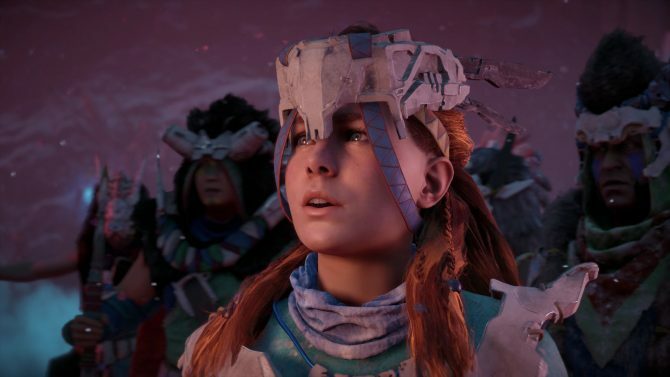 That defining moment in which a developer goes from great to legendary is now, and Horizon Zero Dawn is the catalyst: Guerrilla Games has finally found its calling. 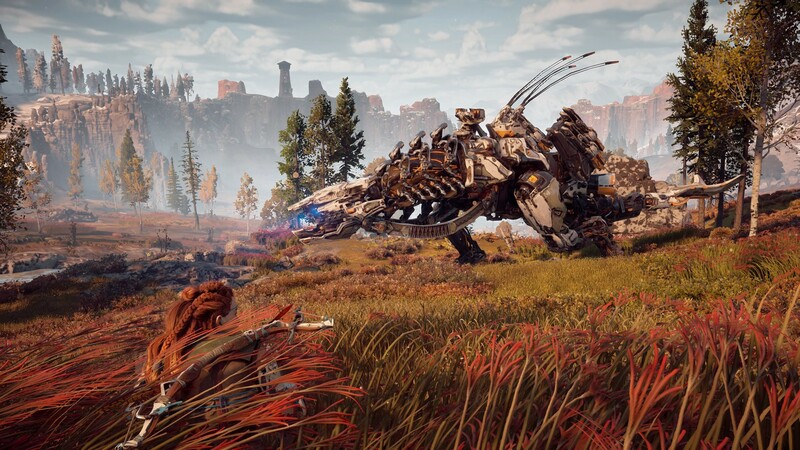 The game places us in the shoes of Aloy, outcast since birth and shunned from the Nora tribe in a post-apocalyptic world where man’s civilization has been nearly wiped out, and dinosaur-shaped mechanical machines dominate the land. Aloy knows nothing of her mother, raised by another outcast, the wise and honorable Rost, who taught her everything she needs to take part in the tribe’s Proving ceremony, and take back her place among her people. Yet, most heroines have something that makes them special, and Aloy definitely isn’t your usual outcast girl. The events of the Proving trigger a chain reaction that will lead her into a grand adventure in search of the secrets of her origins and of the word itself. Speaking of the world, Horizon Zero Dawn‘s setting is definitely one of its most charming features. At first sight, you could just mention that it’s about mecha dinosaurs, and many would already be sold on it, but Guerrilla did not stop at this superficial selling point, and they build a wonderful and multi-layered backdrop for the battles between Aloy and the machines. Mysteries run deep in the bowels of the land (pretty literally), and the remnants of mankind are divided in tribes, each with its own culture and traditions, that have been created with almost fanatical detail by the development team. The result is one of the most vibrant, fascinating and interesting new IPs of the past few years. 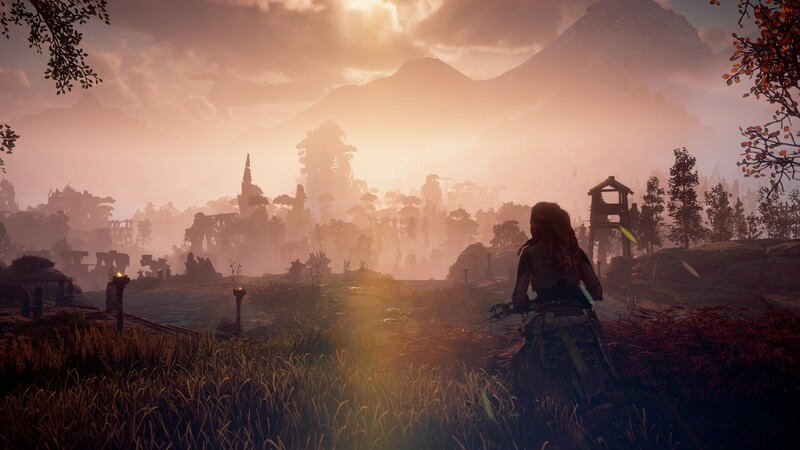 The world of Horizon Zero Dawn will keep your nose glued to the screen as you take in every little detail in architecture, fashion, mythology and art, and scour the screen for secret audio files that will reveal more clues on how humanity lost control of its homeland to the machines. The machines themselves don’t look all that alien, and contribute to the charm of the setting. While they can be defined a sci-fi element, they fit the environment around them perfectly, and due to their influence on humanity’s own culture, they form an organic whole that can only be defined masterful. 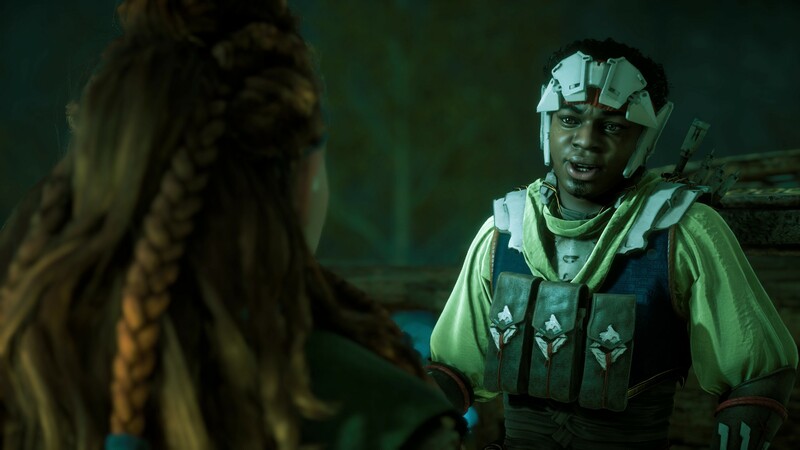 The cast is another solid point in favor of Horizon Zero Dawn, with a ton of attention dedicated to their design and personality. 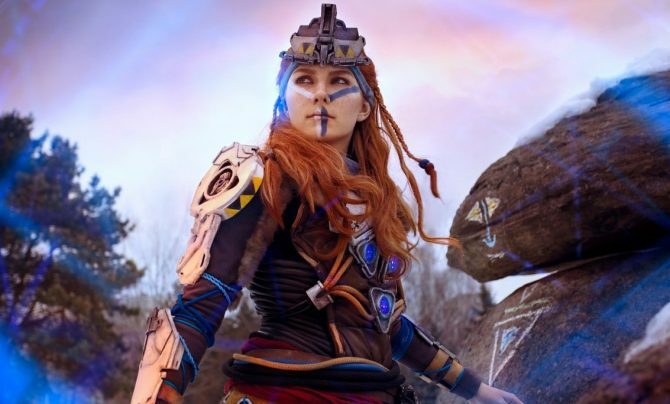 Aloy is of course the queen of the game, witty and rebellious, but extremely likable in her curiosity that sets her continuously in motion in search of answers. Her tribe, the Nora, is extremely set in its ways, to the point of having traditions that can sound downright cruel (but that make sense in their context of survival mixed with superstition). 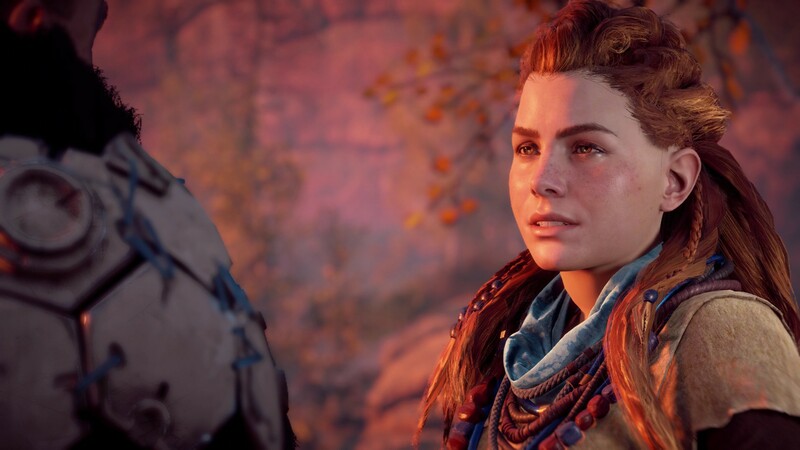 This creates the perfect contrast with the free-spirited Aloy, especially paired with the honorable and composed demeanor of her mentor, Rost. 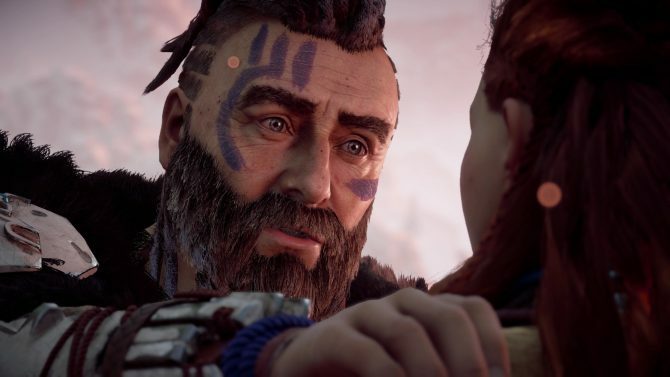 Not all characters are as beautifully outlined as Aloy and Rost, of course, especially considering that there are so many, but there is plenty of charm and many interesting quirks to be explored and enjoyed, enriching further the already deep and engrossing setting. A conversation system also comes with choices that let you take three approaches, which are normally violent, smart and empathetic. This is somewhat similar to the paragon and renegade system included in Mass Effect games, but while it does have some consequences, they aren’t as radical. 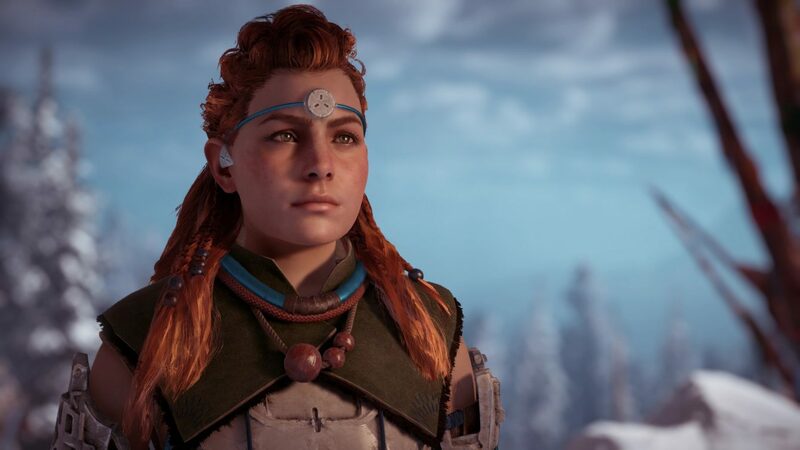 That said, it’s a very welcome way to let you “roleplay” Aloy as best fits your taste. 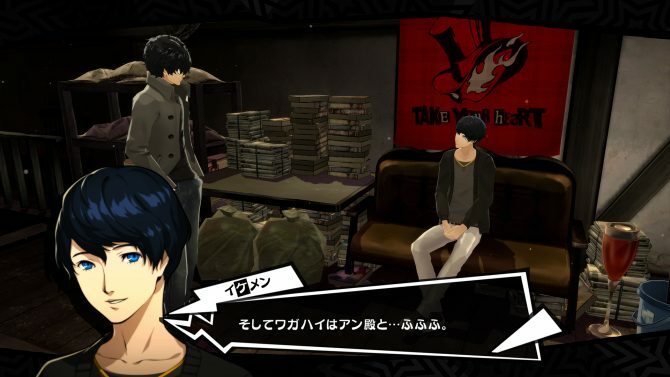 The story is extremely interesting, and while there are a couple of weaker moments here and there, peeling off layer after layer of mystery until the very end, is something that fully absorbed me, making me want to know more and more after every conversation and every clue I discovered. Not only it’s very enjoyable on its own, but it’s also a very solid foundation for what has the potential to be a strong franchise. 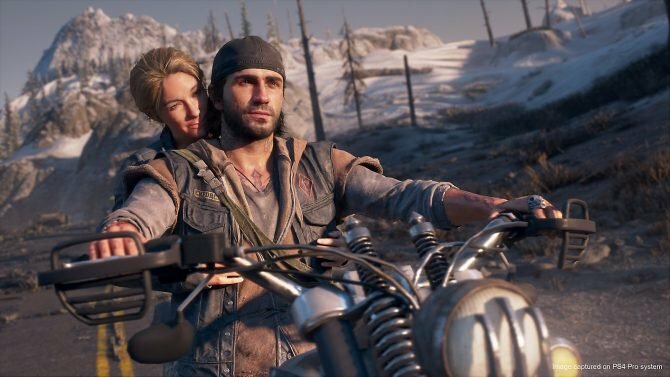 There are also plenty of side quests, and while not all of them excel in depth, thy definitely create a good and welcome diversion from the main storyline. Voice acting is generally good, even if the nature of the dialogue paths can bring forth moments in which lines seem to be a bit disjointed. This is par for the course in games with branching dialogue options, but it can feel a bit jarring in rare occasions. Visuals are doubtlessly the first thing that will leave you with your mouth gaping and your breath taken away in Horizon Zero Dawn. Guerrilla Games’ Decima Engine absolutely shines in basically every aspect of the game, creating environments that can only be defined as some of the most beautiful I have seen in an open world to date. They come with both variety and attention to detail, and you’ll probably find yourself just exploring for the sake of taking in such a beautiful world (not that the game lacks incentives to explore for more practical reasons). From rocks to vegetation, snowy mountains, lush forests and desert areas: Horizon has it all. Yet, that’s not all: everything looks even better thanks to the lighting engine, that bathes the land in a fully dynamic day and night cycle that changes the look of the landscape radically depending on when you visit it. Add the different weather conditions, and the word becomes even more immersive. Character design is equally strong, with beautifully designed outfits, strongly rooted in the research performed to create each tribe. The level of detail is truly astonishing, from Aloy to important NPCs, and even rank-and-file passers-by. 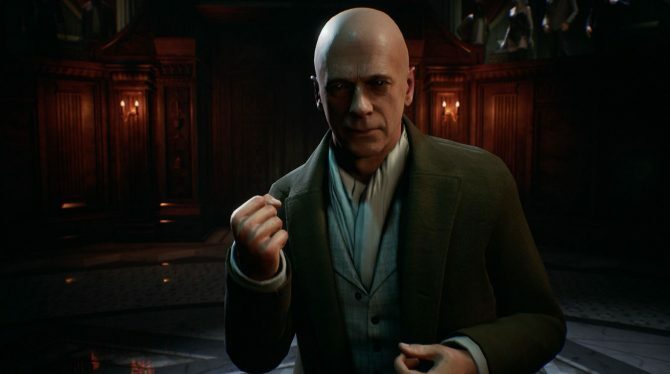 The only little flaw is a limited uncanny valley effect that appears once in a while, with faces that tend to look slightly unnatural in certain situations and lighting conditions, augmented by a few rigid animations. 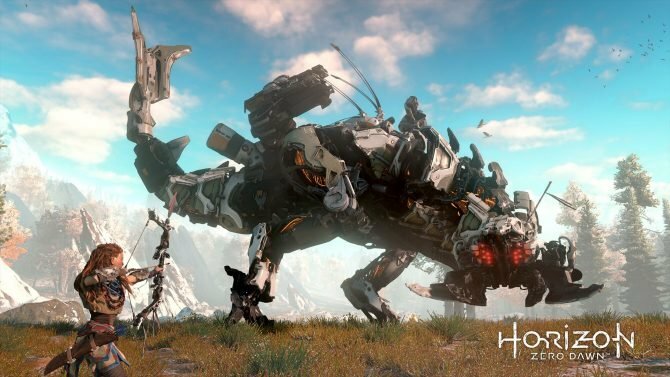 Despite the majestic environments and the beautifully designed characters, the true center piece of the game’s visual presentation are the machines: the team that handled Horizon‘s mecha design must be commended for some of the best looking robotic creatures ever created in the history of gaming. They managed to find a perfect balance between metal and nature, industrial and organic design. Every machine is fascinating in its animal-like features made of plates, circuits, rivets and lenses shining of eerie vitality. Even thanks to animation work that can be defined nothing short of a masterpiece, they appear both natural and unnatural at the same time, and they create an unsettling sensation of belonging in the land we explore even more than humans do. In Horizon Zero Dawn, Earth is truly “ours no more,” and in the game’s beautifully-crafted ecosystem, we are the invaders. Considering how gorgeous the game looks, you shouldn’t be surprised by learning that it comes with one of the most advanced photo mode features in the industry, that goes as far as letting the player control the time of day, perfectly matching the title’s beautiful day/night cycle and lighting engine. Of course, it also comes with a ton of other options, and I can easily predict that many will spend long hours of fun exploring the land and finding the best photo opportunities. Incidentally, the pictures showcased in this article were all taken on PS4 Pro. Horizon Zero Dawn‘s action combat system is absolutely fantastic. While there are some human enemies, the battles against the machines are definitely the most memorable. Our mechanical adversaries strike with very recognizable patterns depending on their “species,” and come with relevant weak points focused on both elements and body parts. This means that knowing your enemies is crucial to your survival. Each species of machines brings forth a completely different fight, prompting you to aim for weaknesses, strike their weapons until they detach and you can use them against their owner, destroy energy reservoirs causing massive explosions, and many more variations. This means that battles are almost always fresh and exciting, not to mention visually spectacular. 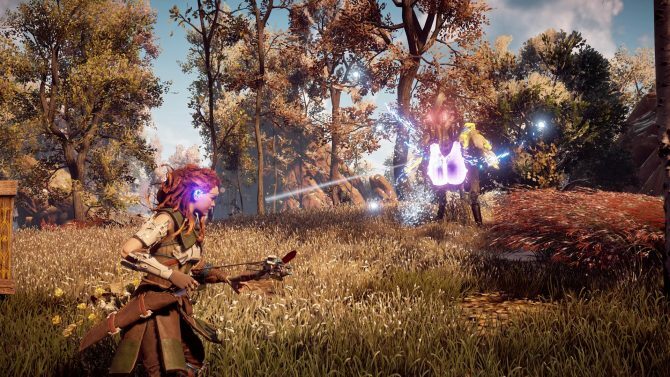 While the game affords you complete freedom in how to approach each encounter, Aloy is fundamentally a huntress: the smaller machines can be taken a little more lightly, but stealth and tactics remain your best friends. 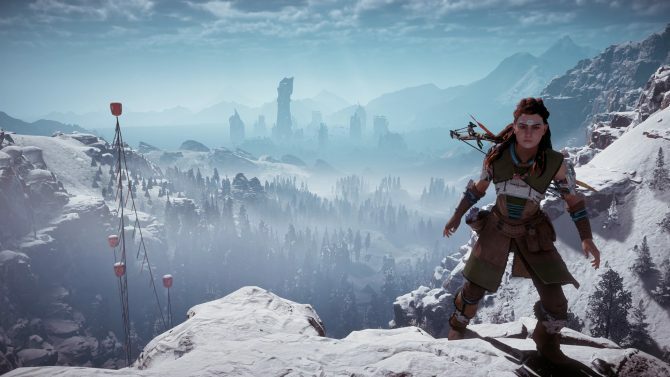 A hack and slash approach won’t take you very far in Horizon. Luckily, you have plenty of tools at your disposal to outsmart the metal critters: your focus will let you scan them for weak points, while a variety of weapons will let you attack them in different ways. The Ropecaster will allow you to restrict their movements, while the tripcaster will lay deadly wire traps in their path. You can also craft traps on your own, and place them in strategic locations where you expect a fight to occur, dealing different kinds of elemental damage on impact. This combines with your ability to move unseen and unheard when crouching in tall grass (while it’s a bit weird that crouching in a bush doesn’t really conceal you), in order to dictate the terms of the upcoming fight before revealing your position. Horizon Zero Dawn isn’t a stealth game, but mastering its stealth elements is basically indispensable if you want to really be effective in battle. Knowing when to remain concealed to prepare the battlefield and give you as much advantages a possible, and when to spring into action to finish a powerful enemy as quickly as you can, marks the difference between life and death, or at least between an elegant kill and a dragged-on battle of attrition. The game’s difficulty is well balanced, as long as you’re not reckless, because even some weaker enemies can overrun you with sheer numbers if you just charge in without the proper awareness of your surroundings. 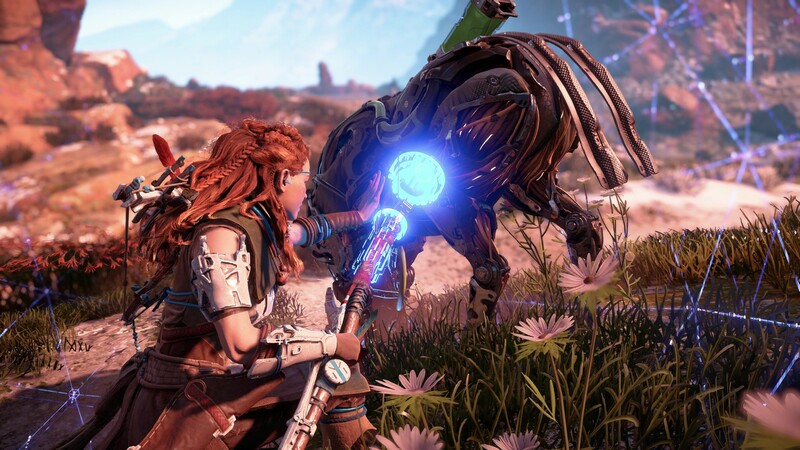 Ultimately, the most satisfying weapon remains the bow, which is the bread and butter of Aloy’s arsenal. 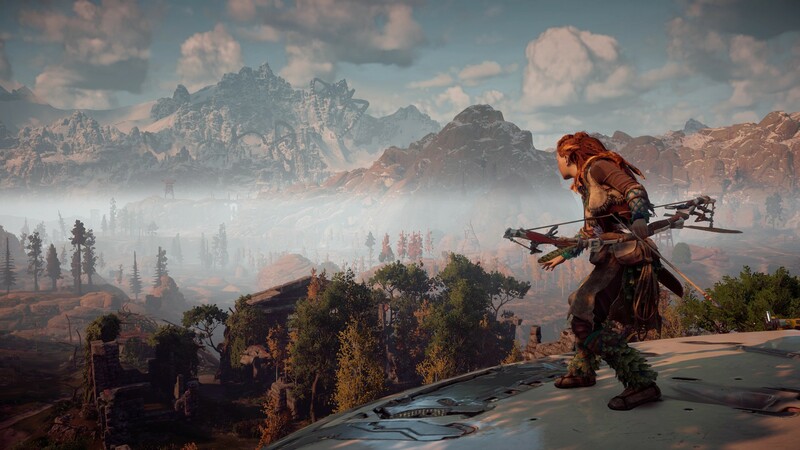 Striking that small weak spot with a well aimed arrow is always a blast (at times literally, since you can craft fire arrows), and contributes greatly to the raw fun factor of fighting the machines in Horizon Zero Dawn. 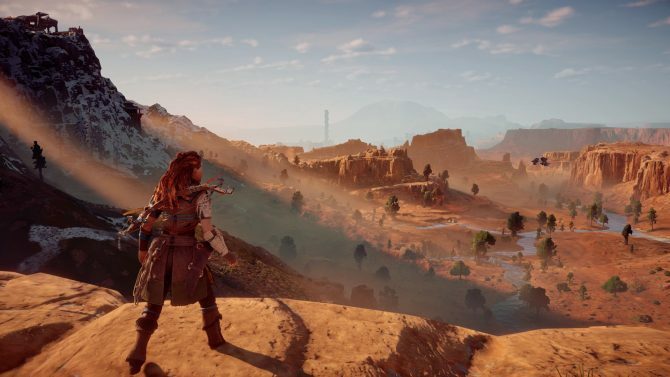 While the combat system is very important, this is a fully fledged RPG, and comes with plenty of systems that will let you tweak the progression of Aloy. There are three different skill trees that you can unlock gradually when leveling up: Prowler turns you into a better prehistoric ninja, Brave improves your face-to-face combat skills, while Forager focuses on utilities like gathering and salvaging. There are no classes, and you don’t need to choose a single tree, allowing you to pick your skills as needed. While there are a few that appear to be a bit more necessary than others, it’s mostly a matter of taste, and different approaches are well balanced. 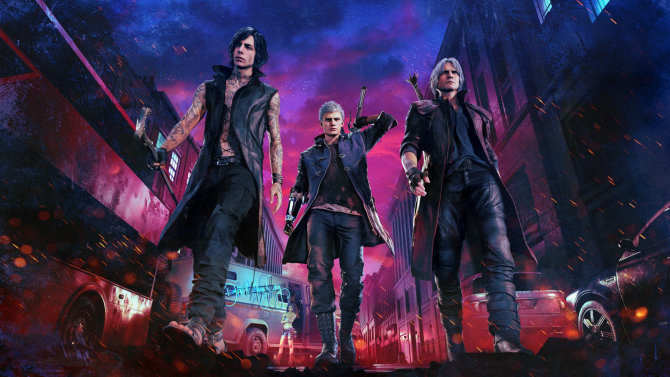 An extensive crafting system, trading with NPCs, and tons upon tons of loot complete the picture, creating one of the best western action RPGs released on the market in the past few years. Ultimately, Horizon Zero Dawn is an absolutely fantastic game. 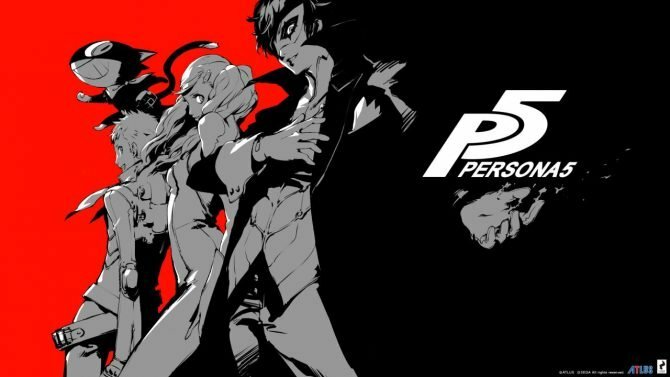 It’s very polished, and comes with a compelling story, relatable characters, an absolutely fascinating setting, and top-notch gameplay. On top of that, its visuals will make you wonder if Santa secretly sneaked into your room to replace your PS4 with a gaming PC while you were asleep. It simply looks that good. 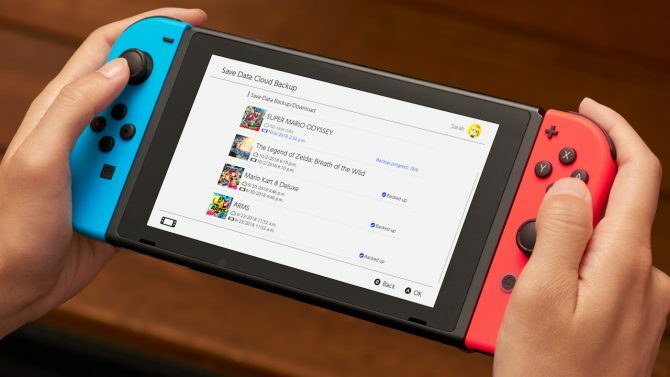 The development team delivered a game that simply has it all, and on top of that comes with a large content suite that will keep you entertained for ten of hours. In years past, they may have struggled to deliver a true masterpiece, but this is it. Guerrilla Games has broken free from the claustrophobic limits of linear shooters and has spread its wings with a gorgeous open world RPG that sets itself as a strong contender for game of the year… and it’s only February.